As the days are getting shorter and the weather outside colder, the season for wonderful warming drinks has begun. Spiced chai tea with milk is one of my favorite winter drinks but I find the coffee house fare overpriced and even the best chai tea bags are somewhat unsatisfying. So a few months ago I set out to find my perfect chai tea recipe. A quick google search gave me some five or six good recipes to begin with. Being the geek that I am, I made a comparison table – which was very helpful as each of the recipes was meant for a different amount of tea and used slightly different spices. Based on the table (and the spices I had at home) I composed a base recipe to be fine-tuned in practice. A little more of this, a little less of that, and I arrived at the recipe below. Pour the water into a saucepan, add anise, cinnamon, ginger, peppercorns, cloves, kardamom, and nutmeg. Bring to boil and simmer for around 5 minutes. Remove from heat and add the loose tea (I use a filter bag) and let it infuse for 3-4 minutes. Meanwhile, if you have the means to do it, steam up around half of the milk – I use our espresso machine for doing this. It’s a little more effort but completely worth it as it gives your chai tea that nice, foamy latte quality. 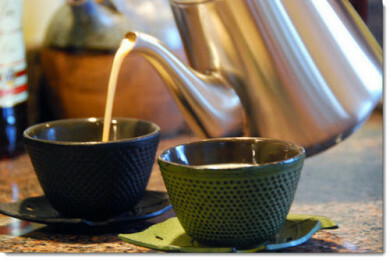 Remove the tea bag(s), add milk and return to the hot plate to warm up. Finally, add honey and serve.